DOUBLE CURLY WEAVE HAIR	There are 20 products. Double curly weave hair products is more full end (less short hair inside bundle) than single curly weave. It is real Vietnamese hair weave with Ponytail hair extensions natural black or dark brown color for your curly hair extensions. 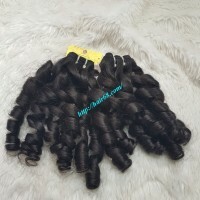 Steam curly weave is strong hair (not broken bottom hair) and no smell, its folds is permanent long time during you use it.